This tribute article is in recognition of the patriotic services made by Burnett Laws. He joined the North West Mounted Police then volunteered for the Boer War, World War I & II. Burnett Laws was born on March 3, 1877 at Prudhoe Northumberland England and his father was J.B.E. Laws. At the age of 20, he immigrated to Canada and joined the North West Mounted Police on July 1, 1899 and was issued the regimental number 3416. After his basic training in Regina, he was transferred to Fort MacLeod. For the Boer War, Commissioner Lawrence Herchmer offered to raise a mounted military unit consisting of hand ‘picked police, ex-police and cowboys.‘ The Canadian government accepted this offer. Members of the Force were given a ‘leave of absence‘ to serve in South Africa. 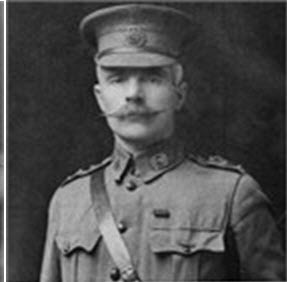 The Commissioner would become the Commanding Officer of the 1st Battalion of the Canadian Mounted Rifles. One of his hand picked NWMP members was Constable Burnett Laws (battalion regimental number 181). Mounted Police members made up 40% of the battalion which consisted of 750 troopers. Burnett Laws served 15 months in South Africa. 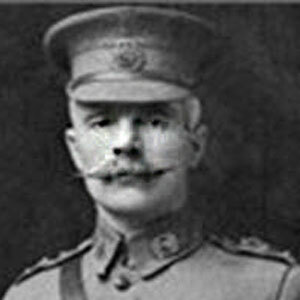 Superintendent Sam Steele would also raise a regiment for the Boer War – the Lord Strathcona Horse Regiment. This regiment also consisted of many NWMP members. 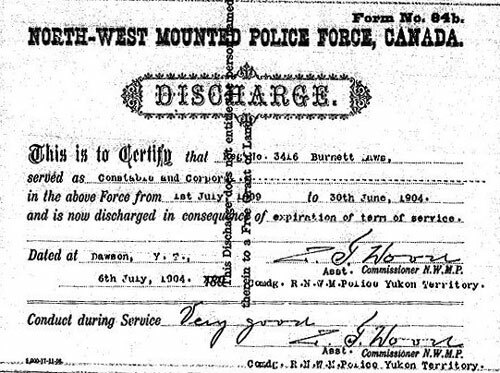 Upon returning to Canada, Burnett Laws resumed his career in the Force and was transferred to Dawson City. 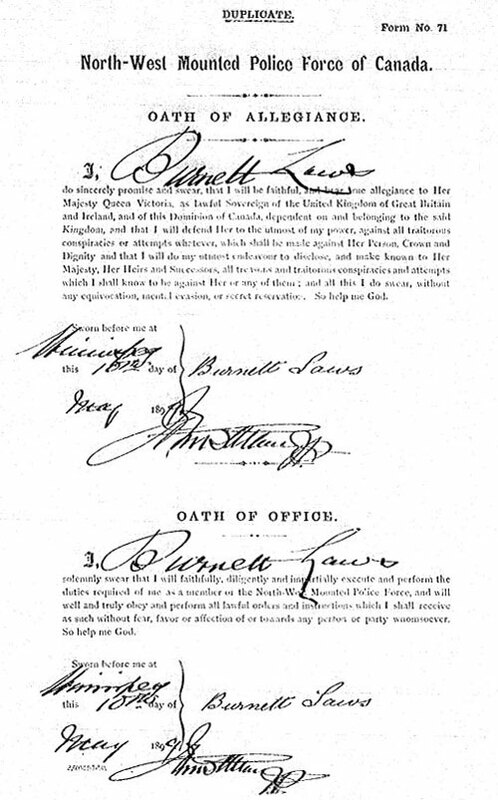 On June 30, 1904, Burnett completed his five year term in the Force and took his discharge at the rank of a Corporal. From Dawson City, he headed to Edmonton Alberta and eventually settled in Lloydminister Saskatchewan as a farmer. While in Lloydminster, he joined the 22nd Saskatchewan Light Horse which was a Lloydminster based Militia regiment. Burnett Laws was a member of this regiment for 8 years. 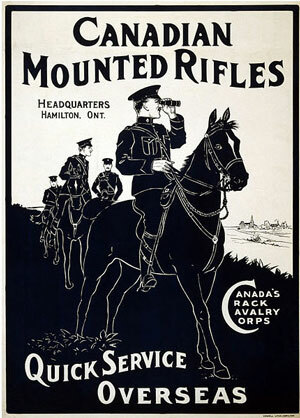 Photograph of a World War I Recruiting Poster for the Canadian Mounted Rifles. With the outbreak of World War I, a mounted infantry unit called the 1st Regiment of the Canadian Mounted Rifles was formed in Brandon Manitoba on November 7th, 1914. A month later on December 1st, 1914, Burnett Laws joined this regiment and was promoted to the rank of Lance Corporal. After receiving their uniform and subsequent training at Camp Sewell in southern Manitoba and at Camp Shorncliffe in England, the regiment landed in France on September 22, 1915. With the trench warfare well established on the western front, horses became a liability rather than a tactical benefit. Therefore on January 1, 1916, the regiment was dismounted and converted to an infantry regiment. With the reorganization of all the Canadian Mounted Rifle regiments, the 1st Regiment became the 1st Battalion of the Canadian Mounted Rifles and fought mostly as a component of the 3rd Canadian Division until the end of the war. On June 2, 1916, the members of the 1st & 4th Battalions of the Canadian Mounted Rifles were manning the 3rd Division’s front when the Germans launched their attack – consisting of four German regiments with the support of five regiments and six regiments in reserve. This battle would be known as the Battle of Mount Sorrel (in the Ypres Salient – 1.9 miles east of Ypres Belgium). With the Canadian positions overrun, 557 of its 692 members were killed, wounded or captured. A combined and coordinated counter-attacks, by elements of the Canadian Corps, was able to retake their original battle lines. By the summer of 1916, the 1st battalion had been rebuilt and it was one of the first Canadian battalions to advance at the Battle of the Somme. On September 15, 1916, the 1st Battalion Canadian Mounted Rifles was among the first way attacking the Mouquet Farm. 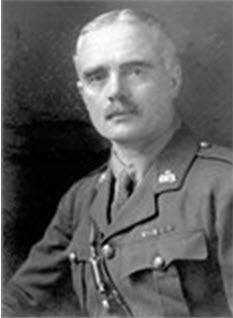 Photograph of Colonel Burnett Laws (Source of photo – Ric Hall’s Photo Collection). 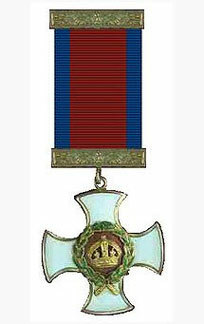 Military Medal – was awarded to non-commissioned officers for bravery in the field of battle. 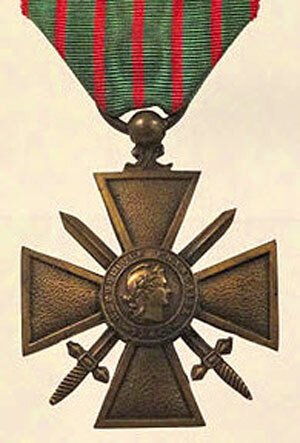 Croix de Guerre (French Military Decoration) – was awarded to soldiers who distinguished themselves by acts of heroism involving combat with the enemy. Distinguished Service Order – was awarded to individuals for instances of meritorious or distinguished service under fire with the enemy. During WWII, Burnett Laws was the Camp Commandant at Dundurn, Saskatchewan. On October 1947, Burnett passed away in Lloydminster. 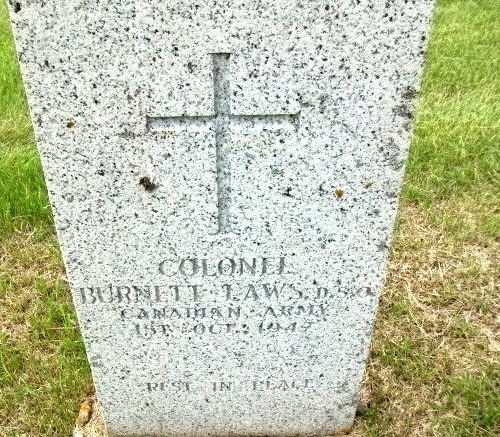 Photograph of Burnett Laws’ grave marker (Source of photo – RCMP Gravesite database). If you have photographs and/or a story about a past Force Veteran, please email Ric Hall at rshall69@shaw.ca Ric will scan the photographs and leave you with the original documents and photographs.